Last month, a new one-minute preview for Shadowhunters surfaced online in a low quality video, but now a high quality version has been posted by the Shadowhunters Twitter account. A making-of special, “Beyond the Shadows: The Making of Shadowhunters,” will air next Sunday, Dec. 6 at 9:30/8:30c on the network. Shadowhunters premieres January 12 at 9/8c on Freeform (ABC Family). That looked much better than other one! Can’t wait! This looks a million times better than before. 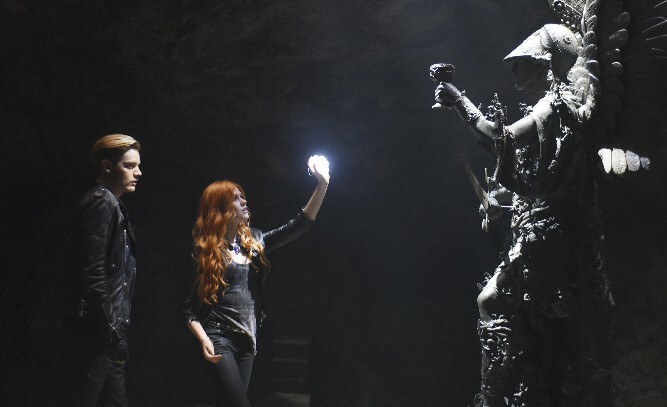 I am still slightly worried about the acting for Clary, it all seems very line for line and wooden, but I think there is still a lot of potential. I wasn’t so sure before but I think this show will work out. The first few episodes might not be so good (and I’m assuming that’s where most of the clips are coming from) but I have no doubts they’ll get better. Fingers crossed, loved this trailer. Forget any comments I’ve left here saying that I didn’t like the show. This is WAY better than that last vid they fed us!!! My one complaint : Now I don’t just have to wait for Lady Midnight, but Shadowhunters to! I hope they have way more of Azazel in here later on, because he was so funny yet mean in Lost Souls. And maybe more of Magnus’ past. And definitely more Raphael, hopefully without killing him! Speaking of Raph, was that him holding a knife to Simon’s throat? When did the Dumort get so clean? But still, cool! I still don’t like a lot of things about this show, but it has potential if I’ve ever seen it! I can’t wait to see this for real, and not just a video! Looks a million times better. Does anyone know where I will be able to watch the show because I live in South Africa and we don’t have ABC family/ freeform in tv. We also don’t have Netflix. Apparently there’s an app called hola that allows you to set your location in the states and watch from the abc family site. OMG! this one is so much better!!!!! !does anyone know the name of the song?